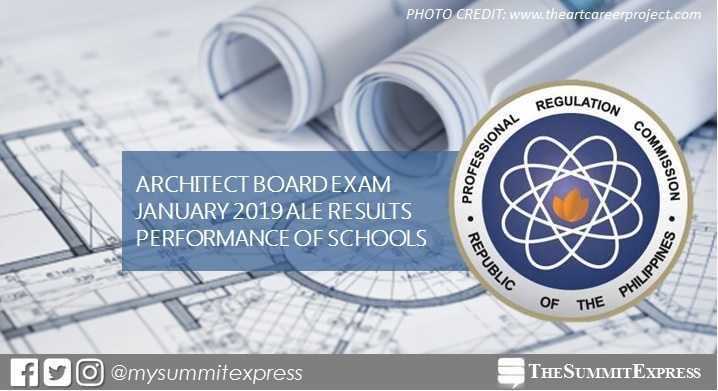 MANILA, Philippines – The Professional Regulation Commission (PRC) hailed the top performing schools in the January 2019 Architect board exam or Architect Licensure Examination (ALE). The results are released today, January 30 or in three (3) working days after the exam. Mapua University (MU) was the lone top school with 84.31% or 43 out of 51 passed the exams. PRC conducted the licensure exam in Manila, Baguio, Cebu, Davao, Legaspi and Zamboanga on January 25 (Friday) and 27 (Sunday). In the January 2018 ALE, University of Santo Tomas (UST) led the schools with 85.71% or 120 out of 140 passed the exams. It was followed by Mapua Institute of Technology (MIT) - Manila with 81.48% or 44 out of 54 hurdled the test. In the January 2017, only UST made it to the list of top performing school, garnering 81.75% or 112 out of 137 passed the test.